Students at UT Elementary School (UTES) improved their cardiovascular skills to raise funds for the American Heart Association’s (AHA) Jump Rope/Hoops for Heart program. Coach Tori Sheard hosted the Heart Challenge fundraiser in which 96 students grades PreK-5th grade jumped rope for a total of 65 minutes between March 22nd and March 23rd. They raised a grand total of $7,357—the highest amount raised by an Austin school this year. The funds went toward a number of programs within the AHA that save countless lives in and around Austin. “UTES is lucky to have such an enthusiastic fitness leader on our campus! 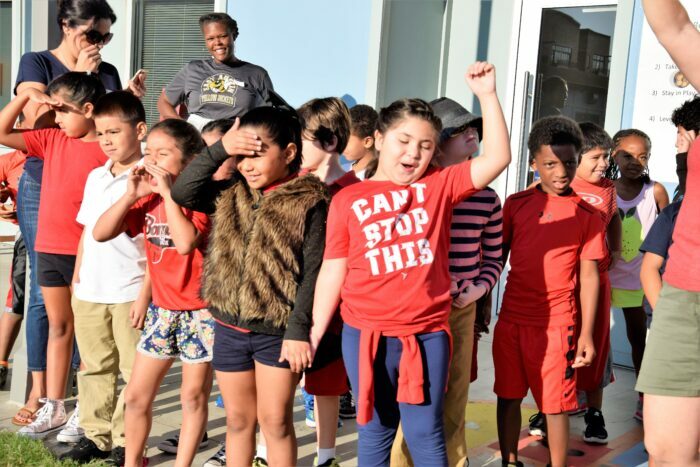 Coach T knows how to motivate students to not only be aware of their health but also the importance of giving back to the community,” said UTES Superintendent Dr. Melissa Chavez. Throughout the campaign, students learned about cardiovascular health and how they could make a difference in the lives of those with heart conditions. This is one of the many community service events the school hosts throughout the year that teach important lessons about health and wellness and philanthropy. Jump Rope/Hoops for Heart is an initiative of SHAPE America and the AHA that raises awareness for heart disease. More than 126,000 kids got jumping and moving in 122 area schools last year through AHA programs and curriculum.